Beckhoff PCIe modules are based on a new definition of highly integrated PCI Express plug-in cards and follow the trend towards ever smaller PCs. The function of PC plug-in cards is integrated in a compact format that is suitable for harsh industrial environments. Compared with PCI or PCIe plug-in cards, which require a special card holder in the Industrial PC, the Beckhoff PCIe module is a genuine industrial product that is firmly screwed to the inside of the PC via the plug connector bracket. The PCIe modules can be retrofitted on site without special PC knowledge. The PC housing does not have to be opened. The 3½-inch motherboard CB3052 offers four PCI Express lanes to be distributed to the PCIe module slots or standard plug-in card slots. The result are PCs with module slots and/or slots for plug-in cards. A PCIe module is connected to the motherboard via one PCI Express lane with a data transfer rate of 2 Gigabit. 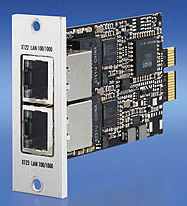 A module can therefore provide two Gigabit Ethernet interfaces, for example. This function was already realised in a PCIe module: the FC9062 module complements the PCs CP62xx, C6515, C6525 and C6930 with two Gigabit Ethernet ports. If two modules are used, these PCs have a total of six Ethernet interfaces, while the PCI Express socket continues to be available for a seventh Ethernet port or a fieldbus interface for PROFIBUS, CANopen, DeviceNet or SERCOS. If only one of the two module slots is equipped with a PCIe module, the second slot is available for feeding motherboard interfaces such as COM ports, USB or sound out of the PC. The connection for a Mini PCI card can also be fed out through the module slots, even if the basic configuration of the PC, e.g. the C6515, does not allow for Mini PCI fieldbus cards.